Armed police are currently said to be in a ‘stand-off’ with a man – who is believed to have a gun – in south London. A number of roads were cordoned off by officers in Croydon at around 9am this morning, March 19, after police heard reports of a man shouting abuse at locals and threatening to kill people. It is thought the man is now sitting in a red car, which is surrounded by police, and officers are trying to resolve the issue peacefully. Police were called shortly after 08:30hrs today by a man threatening to harm people. Officers, including armed officers, attended and located the man in a car in Pagehurst Road, #Addiscombe. Officers remain with the man and are attempting to peacefully resolve the incident. 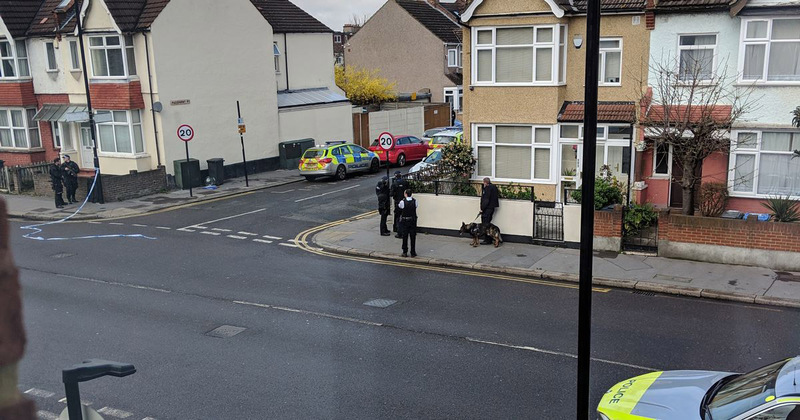 Serious incident in #Addiscombe in #London where a gunman has threatened civilians, and has now been confined to a car by armed police responding to the scene. Transport for London are said to be diverting bus routes through the area, while residents are urged to stay indoors for the time being. One school in the area is also said to be ‘on lockdown’, with staff and students being locked inside the building for their own safety. I live in the building opposite [Pagehurst Road] and I stepped out to go to the park across the street with my dog and on the way back the officers had closed off [part of the road] and were telling people to get back. They said ‘for your own safety go back’. I asked them if it was a bomb and they told me it wasn’t. Armed police officers turned up and then more police officers with a dog. I could see that the red car was surrounded by police vehicles as well as several armed officers. I noticed the man opening the car door a few inches, probably to speak back to the police. The stand-off between police and the armed man came to an end after 10 hours. The suspect is now in custody. A spokesperson for the Metropolitan Police confirmed the situation was resolved and the man had been arrested. Police were called at 08:32hrs on Tuesday, 19 March, by a man who made threats to kill. Officers attended Pagehurst Road near the junction with Addiscombe Road in Addiscombe. A man was found in a car at the location and when approached he intimated he had a firearm. Armed officers and the London Ambulance Service attended the scene, the London Fire Brigade was also informed. Officers have now resolved the situation. The man was arrested at approximately 18:30hrs on suspicion of making threats to kill. He has been taken to a south London police station where he remains in custody. No schools in the area were affected by this incident. There is no evidence of any terrorism motive. At this early stage, there appears to be a domestic element to this incident.